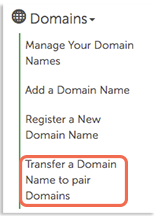 If you are transferring to pair Domains from an outside source, read the Transferring to Us article for things you should do prior to transferring. If the domain name is not already on your Web hosting account, you will be given the opportunity to add it during the transfer process. Simply visit pair Domains, enter your domain name, and select Transfer this Domain Name to pair Domains. It will then walk you through the transfer. For more information on transferring to us, refer to this article about transferring to pair Networks. For information on transferring between accounts, see this article, Transferring Between Accounts. What Types of Domain Hosting are Available? Where do I Change DNS Settings? What is an SRV Record?